On Nov. 16, 1959, night theater audiences first saw one of their favorite shows of all time. It was the Broadway premiere of "The Sound of Music," starring Theodore Bikel and Mary Martin. The last collaboration between composer Richard Rodgers and lyricist Oscar Hammerstein, "The Sound of Music" was very loosely based on the true-life story of the Von Trapps, the family of singers who had to flee their native Austria after the German takeover in 1938. Audiences instantly fell in love with the Rodgers and Hammerstein tunes, including, of course, the title song, sung by Mary Martin. "The Sound of Music" went on to become the second-longest running Broadway musical up to that time. But, still greater success lay just ahead. In 1965, "The Sound of Music" debuted as a motion picture. That incarnation of the musical starred Julie Andrews in the lead as Maria and Christopher Plummer as the Captain -- backed up by a scene-stealing cast of children. To this day, it remains one of the most popular movie musicals of all time. Captain Von Trapp, Maria, and all but two of the original Von Trapp children are gone now, but the family ski lodge is still in business in Vermont. Four of the Captain's great-grandchildren now tour the country as a new generation of singing Von Trapps. 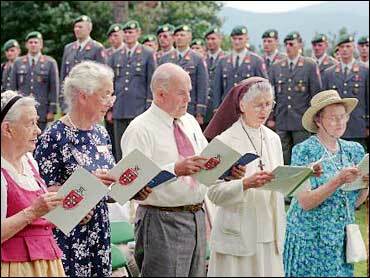 All these decades later, "The Sound of Music" can still be heard.